2nd Women Hockey Super League was inaugurated at the National Hockey Stadium, Lahore in a colourful ceremony. Syed Khursheed Shah, leader of the Opposition in the National Assembly, was the chief guest. 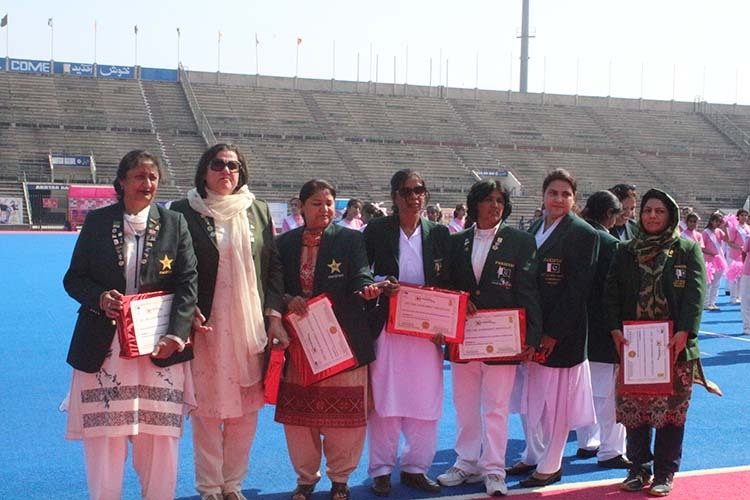 A galaxy of Pakistan’s former women hockey internationals also took part in the march past.These former stalwarts were presented with Life Achievement Awards by the chief guest in recognition of their services to Pakistan hockey. The names included a few who are now settled outside Pakistan. All those present were pleasantly surprised when recorded messages of some of these former stars living outside the country were screened on the big screen in the stadium. It was followed by a colourful PT display by the girl students of the Garrison Academy and The Right School. In the opening match, the defending champions Lahore Lions were surprisingly held to a 2-2 by the Karachi Dolphins. Lahore Lions were apparently cruising to an easy victory courtesy two field goals scored by Sidra Pervaiz and 11 year old Sharika Sarwar. But the Karachi girls fought back through their captain Afshan Naureen who neutralised both the goals via penalty corner conversions. In the second match, a brace by Saima Ghulam enabled Peshawar Deers to defeat Islamabad Shaheens 2 – 0..